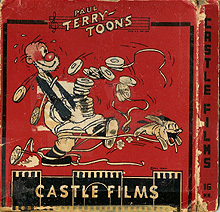 Terrytoons, the New Rochelle New York studio run by Paul Terry, was considered the bottom of the barrel. 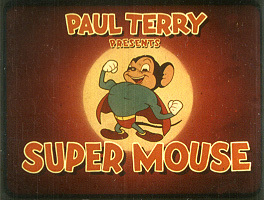 But with popular characters like MIGHTY MOUSE, HECKLE & JECKLE, GANDY GOOSE and SOURPUSS, with great Jim Tyer animation -- and wonderful opening title art -- this studio has it's fans. I'm particularly fond of the two years when Gene Deitch ran the studio (1956-58) and made a bunch of great CinemaScope cartoons (with CLINT CLOBBER, TOM TERRIFIC, GASTON LeCRAYON, etc.) which are completely forgotten today. 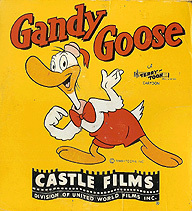 The "New Terrytoons" period in the late 1950s and 60s brought us SIDNEY, HECTOR HEATHCOATE, HASHIMOTO and DEPUTY DAWG. Not to mention THE MIGHTY HEROES and Ralph Bakshi. 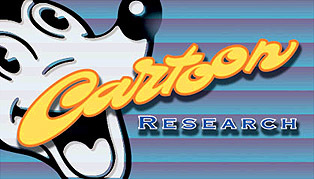 TERRYTOONS were originally released by 20th Century Fox. Today they are owned by CBS-Viacom (under Paramount Pictures). 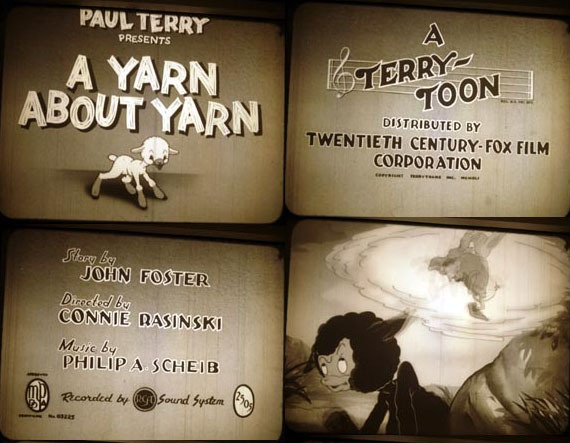 ORIGINAL TERRYTOON COLOR MAIN TITLE: They are pretty much all the same. Here is a typical Heckle & Jeckle. The main difference in the opening "star character" graphic. TOP ROW (left to right): MIGHTY MOUSE, LITTLE ROQUEFORT, DIMWIT and DINGBAT. 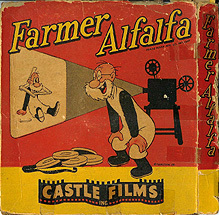 Home Movies: Castle Films licensed Terrytoons for 16mm and 8mm home movies in the 1940s & 50s. 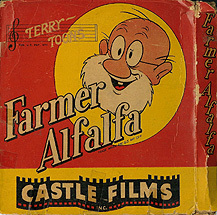 Terrytoon home movie boxes donated to this page by Paul Mular. 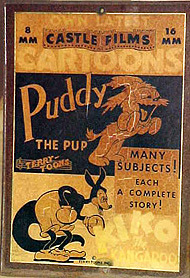 Poster image donated to this webpage by the Tooneriffic Aaron Higgins. 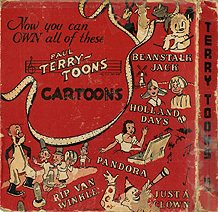 If you are interested in purchasing rare 1930s Terrytoons on dvd - see this page.